Often times pain is caused by tight fascia and muscle. The myofascial junction (the point where the muscle and the fascia meet) is often an area of tenderness and increased tone (resting tightness). While stretching is important in injury prevention, it alone cannot address this area. In conditions like patellar tendonitis, IT band tendonitis, or with simple delayed onset muscle soreness (DOMS) myofascial release can be essential in eliminating pain. There are many ways to perform self myofascial release. In the context of this article, I’ll focus on the use of a foam roll. This is a relatively mild-moderate tool and may not alleviate small points of tightness in the muscle/fascia. If you feel that it it not “reaching that spot” you might want to progress to a tennis or lacrosse ball (to be discussed in a later post). There are different levels of “firmness” available and this is often described as density. I’d recommend a moderate density and you don’t need to invest in any of the rolls with odd patterns/edges – these are more gimmick than they are based in research. Keep it simple and you’ll see progress. 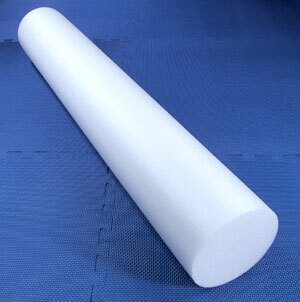 Basic foam roll, 6″ in diameter and 36″ long. Available online from many companies. Look for a price under $20 before tax/shipping. Most running stores also sell them in shorted lengths if transport is an issue (12-24″ long). Listed below are the links to YouTube videos that I’ve posted on several muscles in the body. If you need more of a description, drop me an email and I’d be happy to elaborate! More muscles to come! For the Gymkana members reading this, I’ve donated 4 foam rolls to the team (located in the study lounge). Please take care of them and use them often after practice! This entry was posted in Rehab modalities, Therapeutic Exercises on October 12, 2012 by Angie. So, while there are many levels of resistance bands, I’ll start by describing those that I use in the clinic (and are provided in the Gymkana gym). The levels are progressive, building from an easy to more difficult level. Because the band stretches to provide resistance, the amount of resistance increases the more the band is stretched (keep this in mind when you are anchoring it while you are exercising). Also know that the bands have a breaking point – if you are pulling as hard as you can and you can’t get enough resistance, move up a band (rather than snap it on yourself – it is painful). For you Gymkana folks, there is a box of these bands by the taping table/cabinet. These are FREE for you all to use. Feel free to take a band with you, but when you progress please bring it back and exchange it so there are enough to go around! This entry was posted in Rehab modalities, Shin Splints on September 24, 2012 by Angie.